Disfruta de este post en español haciendo click aquí. If you're like us, you can not get April because you think about Coachella, this post is for you. Here we leave facts about the festival. Did you know that in its first year it was all a failure? Learn more curious facts here. 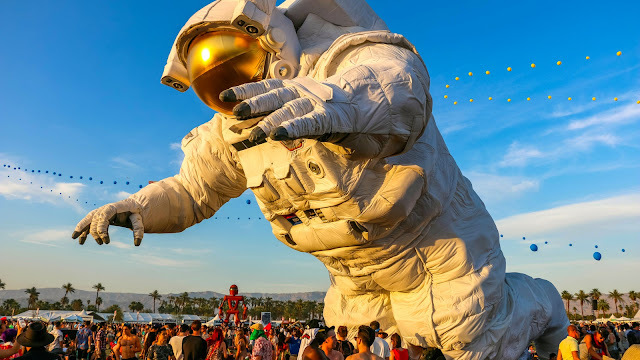 Below we leave an incredible playlist for you to take the music of Coachella everywhere, this playlist sounds better with NUB by EarBolts. A small and powerful speaker that you can take everywhere. If you use our code BASTARDO20 you will get a 20% discount on your purchase. 1. The first year of the festival there were losses of more than $800,000. In 1999, when the festival begins, it had losses of more than eight hundred thousand dollars. In this year the main presentations were by Beck, Tool, The Chemical Brothers, Morrissey and Rage Against the Machine. 2. ATMs are a luxury. The ATM fees are very high, so be sure to bring the necessary cash for the three days of the festival. 3. More than ninety people arrested in a weekend. Coachella, California is a small city. Its population is a little over forty thousand people. So the police are very attentive to the drunken millennials on the days of the festival. In 2013, more than ninety people were arrested on the three days of the festival. 4. Music for all tastes. The festival has gradually moved away from the initial idea of offering only rock bands and has given way to genres such as pop, hip-hop and electronic music. In 2004, Coachella sold out for the first time with Radiohead at the head of the poster. Now the tickets are sold out in just hours. If you want to go, you have to be very attentive. General admission for a weekend is from $ 375. This year we will be covering the festival with NUB by EarBolts. To start the celebration we leave you an exclusive playlist for Spotify. Let's dance! Do you want to know more curious facts about Coachella? Let us know in a comment.